The Hastings Vegan Dining Club held a picnic on the farm of two of our members. They have some 50 acres which they grow veganically (vegan and organic) wheat. 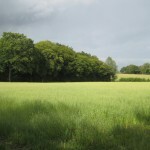 Our picnic took place in a small wooded area among the fields and streams. It was a potluck picnic. So, everyone shared and enjoyed various vegan dishes. 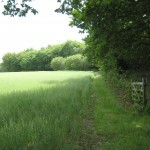 Afterwards we went for a walk around the fields and enjoyed the beautiful East Sussex countryside. To learn more about veganics, go to the Vegan Organic Network. Glorious East Sussex countryside which is vegan and organic. Spectacular field of vegan organic wheat grown in East Sussex. 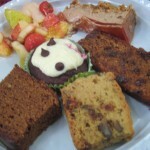 Look at all these delish vegan desserts, including tofu cheesecake, fruit cake, fruit salad and cup cake! This entry was posted in The Grumpy Vegan Life and tagged Glimpses into the Private Life of the Grumpy Vegan, Living the Grumpy Vegan Life. Bookmark the permalink.